Hardened Molded Bumpers are excellent for virtually any application. 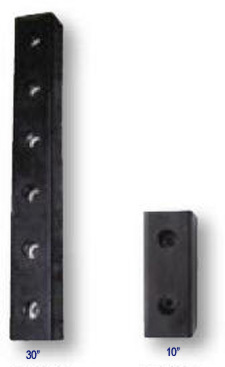 Whether your use is for high traffic docks or In-plant wall protection, these very rugged bumpers are made to incur excessive friction and abrasion. Installation is easy -- 3/4" anchor bolts are installed through existing holes in dock. Resistant to abrasion, friction, impact, wear and corrosion, these bumpers are impervious to weather damage. The 2-piece construction is fully assembled and ready for installation. Hardened Molded Bumpers are 4.5" Wide with a 3" Projection. Available in 10", 20" and 30" Lengths. *Please select appropriate length when ordering.